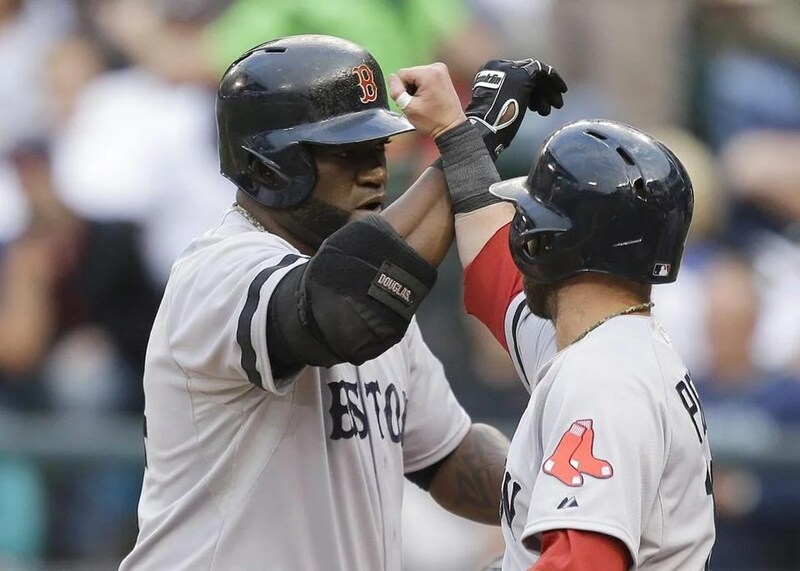 Congratulations to Big Papi, who now holds the Major League record for most hits by a designated hitter! We all knew this day was coming, so there’s no surprise here. It would have been nice to have had it happen at home, but Seattle was a good place, too. After all, the Mariners did sign him when he was still in the Dominican Republic. It’s not their fault he’s not currently wearing their uniform. Oh, wait. It is. Through the first three, it was all us, almost all the time. Papi doubled, Napoli walked, and Nava got hit in the second. Then Salty and Iglesias both hit sac flies that scored two. Not exactly a great response in a bases-loaded situation, but better than nothing. With two out in the third, Pedroia walked, and Papi smashed a home run. With two out in the fourth, Ellsbury doubled and scored on a single by Victorino. And then Salty and Iglesias hit back-to-back singles to lead off the sixth, Holt grounded into a force out, and we executed four straight scoring plays: Ellsbury and Victorino both singled, Pedroia reached on a force attempt thanks to a throwing error, and Papi hit a sac fly. We even took it down to the wire. Nava and Salty led off the ninth with back-to-back walks; eventually Nava scored on a wild pitch and Salty scored on a single by Carp. And now for the pitching. Felix Doubront, ladies and gentlemen! His outing was almost impeccable. He pitched seven innings of one-run ball that were almost seven innings of shutout ball had it not been for the double-single combination in the seventh initiated by, of all people, Jason Bay. The greatest number of batters he faced in an inning was five, and that was only twice. He threw 107 pitches, sixty-six of which were strikes, and his command and control were evident throughout. It would have been quite nice to win, 11-1. But Brandon Workman came on for the eighth and gave up a solo shot and three doubles for a total of three runs. So we won, 11-4, instead. While Theo is busy taking kudos in Chicago, we still don’t have any news on his compensation, but life goes on. Eight members of the team filed for free agency; none of the filings are surprising: Conor Jackson, Trever Miller, Bedard, Drew, Wake, Tek, Papi, and Paps. Okay, maybe I was surprised that Drew chose to file instead of retire. But everyone knew the rest of them were going to be filing. Obviously there’s been a lot of talk about whether to keep Papi and Paps on board. The difficulty with Papi is that he’ll want more money for more years, although his recent performance, certainly in the last season, suggests that that’s warranted. Paps wants more money. Like, a lot more money. You might say we can afford to lose him because we have Bard, but I have a feeling that you won’t know how valuable it was having Bard as a closer-esque setup man packing that one-two punch with Paps unless Paps were to leave and then you’d be fishing around for an eighth inning guy as good as all that. Trust me, it wouldn’t be Jenks, folks. As far as Wake and Tek go, we don’t have much to lose by keeping them. Their market value is relatively low as it is; it’s not like they can leverage high demand to induce a bigger deal from us. Tek’s powers of leadership are here with this team; it’s unclear how valuable he’d be in another clubhouse since that was always his main contributor anyway, especially in recent years when his plate production has markedly decreased, although it is worth noting that he seemed to share in Tito’s experience of having his leadership be less effective this past year. Either that or he pulled back on his leadership. Either way, the results were the results; how much that had to do with Tek is unclear. Regarding Wake, he’s still an effective pitcher, more so in the bullpen now than as a starter; I guess age does eventually take its toll even on a knuckleballer. So Wake will have to figure out if he’d be satisfied as a reliever. Ben, like Theo, will be unlikely to dish out coin if he’s not absolutely sure that he’s paying for the player’s worth alone; if Ben is interested in retaining Wake as a reliever but Wake wants to start and demands a starter’s salary, that could potentially be a problem. Speaking of Ben, apparently he graduated from Lebanon High School in 1992, so the school has reportedly posted a sign out front that says, “Congratulations Ben Cherington Class of ’92 Free Tickets?” Hey, it doesn’t hurt to ask. Jackson, Miller, and Bedard were late-season playoff fixes that we obviously didn’t end up needing. The decision of whether to retain them doesn’t strike me as epically impactful, although given the fact that we’re technically short a starter now, Bedard may make sense if there’s no one better out there. We picked up Scutaro’s option, probably as insurance until Jose Iglesias is ready to permanently assume the starter’s role. We declined options on Wheeler and Atchison. Congratulations to Ellsbury, Gonzalez, and Pedroia on their Gold Gloves! And congratulations to Ellsbury, Gonzalez, and Papi on their Silver Sluggers! All very well deserved; I can’t think of anyone who deserved them more. Finally, congratulations to Luis Tiant for landing on this year’s Hall of Fame ballot. It’s about time! Lackey had his Tommy John surgery on Tuesday. Supposedly it went well. This week, the managerial interviews began. First up was Phillies hitting coach Pete Mackanin. Then we had Brewers hitting coach Dale Sveum, our former third base coach. We’ve got Rangers pitching coach Mike Maddux and Cleveland bench coach Sandy Alomar, Jr. Of those four, Mackanin and Maddux would obviously be preferable, which is why Theo is interviewing them also. Add to our growing list of vacancies a strength and conditioning coach and an assistant athletic trainer. Apparently we fired Dave Page and Greg Barajas. Also worth noting is the fact that the Mets will construct a few walls in Citi Field for the explicit purpose of decreasing the size of the field. Among those walls will be an eight-foot installment in front of the sixteen-foot Great Wall of Flushing, between which will be built a new section of seats a la the Green Monster. As far as I’m concerned, this is one of the most blatant agenda-pushing moves I’ve ever seen. So they constructed an enormous ballpark that is forcing well-paid power hitters, like David Wright and, oh, yeah, Jason Bay, to struggle. Big deal. You don’t see any other ballclub undergoing offseason construction to shrink the field size just to increase home run production to make more money. That is ridiculous, and I’m surprised that it’s being allowed. Maybe Bud Selig is considering it yet another step forward toward making baseball even more popular; we all know how much he praises the home run as a tool to accomplish that. But still. I can’t believe this is flying under the radar. In other news, the Pats lost to the Steelers, 25-17. Before the season started, I think we all picked that one as a possible loss. At least the score was respectable. The Bruins scored a ton of goals this week. We beat the Sens, 5-3, and then we absolutely buried the Leafs, 7-0. Tyler Seguin posted his first-ever NHL hat trick en route. Yeah. If you thought last week was boring, just prepare to not hold onto your hat, because this week was even worse. Last year, we were entertained by Dice-K drama, Jason Bay drama, and arbitration drama, among other things. Not so this year. This year was smooth sailing. Actually, given all the bargain-hunting that Theo did the past two years, it’s not surprising. We’ve got a strong foundation heading into 2011 as a result. And it’s been pretty good not having to parse various whines and complaints. The Yankees acquired Rafael Soriano. That was pretty much it, and that doesn’t even have anything to do with us. Cashman did this partly to live up to his namesake and partly to counter all of our moves, but it’s weak revenge. Soriano is one guy. The last time the Yankees tried to strengthen their entire team with only one guy was back when they acquired Randy Johnson, and that was an epic fail. Yankee fans would argue that we tried to fix all of our problems with two guys. As usual, they would be incredibly wrong. Our problems last year had nothing to do with the team; they had everything to do with injuries. We saw, during that one glimmering window of health before the All-Star break, that that team was World Series material. All we did during the offseason was make it even more like World Series material. So I’ll let the rest of the baseball community sweat this out. I personally am not concerned. So Soriano will set up for Rivera; big deal. That’s, what, two, maybe three innings? If I were them, I’d be spending less time perfecting the last two or three innings and more time worrying about the first six or seven. Because, with our lineup, by the time Soriano rolls around, the crush will already have occurred and the ownage will already have taken place. The Soriano-Rivera combination can not undo damage that’s already been done; they can merely prevent further damage, and imperfectly at that. We’ve beaten Rivera before, in incredibly big ways, and we will do it again. That is a fact. So if this helps Cashman sleep at night, go ahead and be my guest, but he’s not transferring any insomnia to me. No, sir. I for one will be riding Theo’s genius all the way to November. 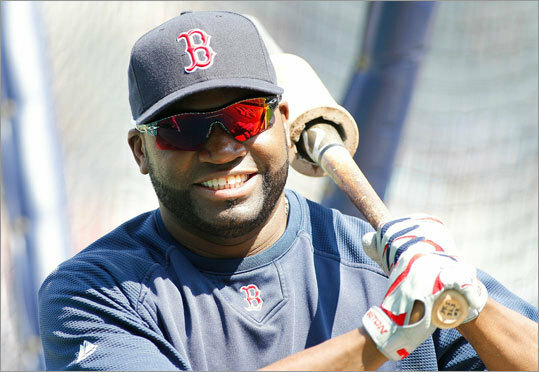 Speaking of which, I should mention that Papi is going to have a monster year. We have identified a problem to which he has seemed to be prone in the past: that of pressure due to a lack of adjacent big bats in the lineup. Yeah. About that. That is supremely no longer a problem. The Cubs claimed Max Ramirez off waivers. Good for them. They need him more than we do. In other news, the Bruins beat the Penguins, Senators, and Flyers this week. But those last two were the highlights. Seriously. First, we shut out the Sens, 6-zip. I’m not kidding. Then, two days later, we followed that with a win over Philly by a final score of 7-5; five of those seven goals were scored in the third period alone. Those are ridiculous. Both of those are baseball scores on a good day. Even our win over Pittsburgh was accomplished with four goals. This is great. Solid goalie performances plus high-scoring games equals lots to look forward to this spring. We ended the week with a one-goal loss to the Penguins, which wasn’t so great, but you can’t win ‘em all, I guess. Meanwhile, the Pats take on the Jets this afternoon in playoff elimination. If we win today, we play the Steelers next weekend. Let’s do this. Whoa. I don’t even know what that was. I think that was our lineup trying to make up for our lack of offense during the Rays series in a single night. Whatever it was, it definitely worked. Although if you ask me, I would’ve liked to have borrowed some of the runs from last night and used them against the Rays. We definitely had enough runs to go around. Last night’s game as absolutely fantastic. It was an absolute rout of a team that stood absolutely no chance. It was a decisive, dominant defeat that absolutely snapped our four-game losing streak. You don’t get much more absolute than that. We continue to be undefeated at the Rogers Centre this year and have won thirteen of our last nineteen contests there. We have a grand total of eighty-nine wins there, more than any other visitor. Can we say Fenway North? The final score was a whopping 14-3. That was our second-highest game run total this year, our highest being seventeen against the Angels on May 3. (Buchholz picked up that win.) It featured a three-run second, a seven-run third, a three-run fourth, and a one-run sixth. Four of those runs were unearned, but in the final score a run is a run, and it just goes to show you that Toronto’s pitching as well as its defense were terrible. Cameron started us off with an RBI single, which Hall promptly followed with a two-run home run hit deep out to center, his seventh of the season. Romero fed him a steady diet of up and away, and he finally got just enough bat on one to line it out to the opposite field. But that was nothing compared to what we were about to unleash on Romero in the third. Simply put, he got rocked. Hard. Here we go. Youk hit a sac fly to start things off. Then McDonald scored when Drew hit into a fielder’s choice. Then Romero left with the bases loaded. It’s the second straight start in which he’s been unable to get past the third. Something I readily noticed: his changeup was horrible. Then Cameron walked with the bases loaded. Then Hall hit a sac fly. Then Scutaro hit a two-RBI single, followed by an RBI single by McDonald. So that was the seven-run third, which gave us a ten-run lead, but we weren’t about to stop there. The three-run fourth was still to come. If the third showed the power of small ball, the fourth was about to show pure power, period. Youk and Beltre belted back-to-back jacks. That was the third time this season they did that. Youk’s ball cleared that left field wall in a hurry. I’d like to see Nick Swisher do that! (Actually, I wouldn’t, but you know what I mean.) I can’t believe that Youk lost the Final Vote to Nick Swisher. Nick Swisher! I don’t even understand how that’s possible! Of all the people on the list to lose to, it had to be Nick Swisher? Whatever. Youk is over it, so I guess we should move on as well. Anyway, then Drew grounded out, and Cameron added another jack. His ball landed in left as well. Three home runs is a lot for one inning. It’s even a lot for one game, and we finished the game with four! The last time we hit at least three jacks in one frame was the fifth on May 20, 2009, when Tek, Papi, Bay, and Lowell all went deep against the Jays, appropriately enough, at Fenway. I’m telling you, I watched those home runs and I thought they were showing replays. That’s what it looks like when you watch jack after jack. It was so awesome. So all four home runs were lined out, lasers as Pedroia would say. Hall finished the night three for four with the home run and two doubles as well, batting in a game-high four runs. It was his first time hitting in Rogers Centre with the roof open; it’s amazing how much of a hitter’s park it becomes when it’s open. Youk’s home run was his only hit, and we’ll take it. Beltre finished two for three. Cameron finished three for four; he’s had six hits in his last two games. And Drew has also quietly been on a tear in his last six. And last but most certainly not least, Jon Lester. He wasn’t as economical as he usually is, but his outing was still excellent. He tossed six frames, gave up two runs on four hits including a solo shot, walked two, and struck out six. He threw ninety-six pitches total and picked up the win. I agree with Hall; Lester should totally start the All-Star Game. His cut fastball was sharp, as were his changeup, sinker, and curveball. He threw his game high of twenty pitches in the second and game low of eleven in the third, and he was pretty consistent in his other four innings. His release point was perfect. He didn’t throw any balls around the upper left or bottom right corners of the zone, but his zone itself was nice and even. His movement was spot-on. So he mixed his pitches well, varied his speeds, and did everything he usually does. Manuel allowed the third Jays run, and Richardson pitched the ninth. Done. Unfortunately, the prediction that V-Mart will return soon after the break was a bit too ambitious. He’ll be out longer. Ellsbury, on the other hand, is back with the team. He’s in Toronto, working out with the team and seeing team doctors. I can’t wait to see him back in the outfield again. So last night was a spectacular night for everybody. Tito won his nine hundredth Major League game, the starters got to rest because of the big lead, we received a big boost to our morale, and we won! This afternoon, we hope to give Lackey a similar offensive cushion – that wasn’t even a cushion, that was a mattress or something huge – as he takes on Morrow. Most importantly, we look to build some momentum going into the break so we can start the second half on good footing. Wow. That was powerful. Absolutely. Dice-K’s start last night is a cause for hope. He showed clear improvement from his previous start. It was pretty much a clear flip of that start, when the badness came at the end of his outing. Last night, he put us in a hole in the beginning but proceeded to settle down and keep us in the ballgame. His outing was a little bit longer, a little more efficient, and a little more effective, and was sufficiently better to earn him the win. If he keeps moving in this direction, he’ll be right solid eventually. He gave up four runs in the top of the first on thirty-nine pitches, only the first two of which were located well. To his credit, all were via small ball. But he only needed eight pitches to get out of the second and at most fifteen in his next three innings. He went one out past five innings, gave up five runs on five hits, walked three, and struck out three. So his command still needs work. He threw ninety-three pitches total. His best was his two-seam, followed by his cutter and four-seam. His slider and curveball were pretty good, but I’d work on that changeup. His strike zone was pretty messy. He threw very few pitches to the right; most balls were to the left of the strike zone and at the lower right corner. The fact that his fastest pitches don’t have much movement could be a potential problem down the road, once batters have had a chance to check him out, so he might want to work on that too. But like I said, all in all it was a good sign that he’s moving forward constructively, and we’ll have to be happy with this type of outing from him for a while. Delcarmen got a hold after allowing a run. Okajima pitched well, and Ramirez worked around two hits and a walk with three K’s. But have no fear, the offense was here. And it all started with V-Mart, who launched a two-run homer into the bullpen in right field. A fastball up and away, and he buried it to end a streak of ninety homerless at-bats. If he gets hot, he’ll be another piece to the puzzle; we’re depending on his offense this season in the absence of Jason Bay; Tek has actually borne the brunt of that in his starts, but if V-Mart can get hot too, that would be a tremendous asset to the lineup. But we made this game in the fifth and sixth. When V-Mart stepped up again, all bets were off. He stroked a two-run double to start the inning. Hermida followed that with a two-run single, and McDonald followed that with a one-run single. End the fifth. Napoli hit a two-run shot off Delcarmen in the top of the sixth, but Pedroia answered with a bases-loaded walk, followed by Beltre stroking an RBI single, with Lowell scoring on Kendrick’s fielding error and McDonald finishing it off by grounding into a fielder’s choice that allowed Drew to cross the plate. So Pedroia and V-Mart finish two for four, and Beltre finished two for five. McDonald also had a double to his credit. We left ten on base, but we scored eleven runs on as many hits to make the final score 11-6, us. I would also hereby like to give V-Mart credit for working on his D. Entering last night’s contest, he’d thrown out a baserunner in three of his last five contests. Pretty dramatic turnaround. He’s obviously been putting in the work, so that’s a major E for Effort right there. In case you’re wondering, yes, we did just sweep the Angels in a four-game series to vault us over the .500 mark. I repeat: we just swept the Angels in a four-game set. In case you were wondering. And I’d much rather sweep the Angels than sweep the Orioles. This was easily our best series of the season. Looks like the pre-series team meeting paid off. And now, the Evil Empire. Josh Beckett gets another go at them tonight. I want to win. Buchholz made his debut on Sunday, when we barely eked own a win against Baltimore. After two out in the first, Buchholz followed a home run with two outs before finally ending it. It wasn’t pretty, and the ugliness proceeded until the end of the game. It’s the kid’s first start of Spring Training; there’s no cause for concern. Lester wasn’t so hot during his first start, either. On Monday, Beckett pitched three perfect frames and struck out three. His off-speeds were fantastic, so he’s meeting his goal of improving those. By the way, contract negotiations with Beckett are already underway and seem to be progressing in a good direction. Score one for not having a repeat of the Jason Bay situation. Look for the Red Sox to offer around three years. Paps and Okajima threw hitless frames of their own after that. In fact, we almost had ourselves a no-no; the Cardinals didn’t pick up their first hit until the seventh. On Tuesday, Wakefield blanked the Marlins for three innings. Two hits, one strikeout, thirty pitches, twenty-two of which were strikes. It was beautiful. On Wednesday, Daniel Bard broke one hundred miles per hour. He’s so good, sometimes he scares me. Pedroia and Scutaro worked on double play drills, and they look like they’ve been turning two together for years. It’s great to watch, and it bodes really well for the regular season. If your double-play combo doesn’t mesh, you’re in deep trouble, but it seems like we’re good to go. Speaking of Pedroia, I would just like to mention that he has more doubles than strikeouts. How ‘bout that. Mike Cameron is amazed at how much cocky trash-talk comes out of Pedroia’s mouth, but to most of us that’s old news. I’ll say this, though, especially in light of that statistic: there are those who talk trash, and then there are those who talk trash and back it up. Dustin Pedroia talks trash only when he can back it up. And believe me, he always backs it up. On Thursday, Lackey and V-Mart allayed any concerns about battery chemistry. I mean, from V-Mart’s standpoint, it’s hard not to have a feel for a guy you hit at a .476 average. That, and we had our first encounter with Jason Bay in a Mets uniform. That was pretty unpleasant. V-Mart, by the way, needs to work on throwing people out. In thirty-one games behind the plate for us last year, he threw out eleven percent of attempting stealers. That’s low and needs to increase. Dice-K looked good during his bullpen session on Sunday and could be pitching in a game next week; let’s hope for the best. And now to refute the weekly round of we-don’t-have-any-offense rumors that are as false this week as they were last week, and the week before, and the week before. We have four infielders who’ve scored at least one hundred runs at least once in their careers. And this is our first infield since 1951 that’s scored at least one hundred runs in a season. The dream to play baseball in the big leagues started here. I really wanted to have that be the last uniform I ever put on. You have to hand it to him for loving the organization so much that he wanted to be remembered as part of it, even though, five and a half years ago, he had a really strange way of showing it. Nevertheless, this was a great idea, one he suggested and one that the brass supported completely. That’s what I call closure to a career that started and ended here, in this city, in this park, and before this Nation. Of course, there’s no denying the badness, but we’ll always have the goodness, too. I mean, he’s Nomah. So, hats off to you; we’ve seen you through your best and worst; we watched you develop into what looked like the beginnings of an all-time great, we watched you leave, and we’ve seen you return. And through all the good and the bad, it’s been a great ride. And now, we’re going to watch him become a baseball analyst for ESPN, and if the commentary we heard from him a few months ago was any indication of what’s to come, we wish him good luck. Because between you and me, he’ll need it by the truckload. And that’s the end, I guess. So not a bad week, all in all. Wake is fighting for all he’s worth for that fifth spot in the rotation, and it looks like Buchholz will have to step it up if he wants in on that, too. I’m just happy that Dice-K seems to be making good progress. We’ll see what next week has in store. Not only did we lose to the Pens on Sunday, but Marc Savard is now on the injured reserve due to a head injury. Matt Cooke’s left arm and shoulder hit him in the head from behind. No, wait, it gets better. Cooke wasn’t penalized for the hit. Can you believe that? Savard was momentarily unconscious due to a blind-side hit and Cooke got off the hook. I mean, what? There should definitely be a rule on the books next season banning those officially. Meanwhile, just don’t do it. It’s dirty and dishonorable. And speaking of the Penguins, I don’t even want to comment on Sidney Crosby’s winning goal in the Olympics. But I congratulate Canada and the United States on gold and silver, respectively. It was a great game, and the medals were well-deserved. Anyway, we spent the rest of the week losing to the Leafs in overtime and thrashing the Flyers. We play the Habs tonight, and this is important because we’re barely hanging on to the eighth seed in the conference. By the way, the Caps have already clinched their division with ninety-nine points. Talk about dominant. On Wednesday we had our first full-squad workout. Folks, Spring Training is very much underway, and we’re in business! We have mere weeks until Opening Day. (I’m sorry; I refuse to call it Opening Night.) Theo and Tito were pleased, which means things are going well. Did I mention that we have mere weeks until Opening Day? Dice-K was cleared on Monday to start throwing at sixty and ninety feet. He increased that to 120 feet on Thursday, so that’s progress. And we have our starting rotation for the first week: Casey Kelly will throw first, Bonser will throw second, Beckett gets the Grapefruit League opener during which Wakefield will be a priority reliever, and then Lackey followed by Buchholz. Not bad. I’ll be interested to see how Kelly fares. Turns out Drew spent most of last season playing through a sore left shoulder, which has been repaired with surgery this offseason. He’s going to start Spring Training slowly and raise the bar as it goes on. On a related note, I don’t like this. The secrecy with the injuries has to stop. If something’s wrong with you, you take some sort of measure to fix it immediately, end of story. But don’t make it worse. Obviously any true competitor will want to power through it, but after a point you need to step back and measure whether you’d be helping or hurting the team by hurting yourself. It’s a fine line. Speaking of which, Delcarmen has promised to be more open about his injuries. Call that a case in point. Now, there’s a man who knows what’s up. None of this prima donna drama you find around the league with arrogant big shots with one foot out the door who need a lesson in humility. I’m telling you, however this ends, Lowell has certainly set himself up as the ideal role model for other players. And as far as we, the Nation is concerned, he said he loves our support. I think I speak for all of us when I say he’s most definitely earned it. Boston Dirt Dogs called out the Red Sox for not being original in designing their new Lee County Spring Training facility. Apparently the Sox can’t do anything “beyond Fenway replicas.” Call me crazy, but when you want your guys prepping for the season, doesn’t it actually make sense for the training park to resemble the actual park? Especially for the new guys and prospects? If you’re playing eighty games in one stadium, you want everyone completely comfortable in there, and one way to do that is to train in a park that looks and feels like it. So I fail to see the problem with that. Finally, I’m getting really sick and tired of listening to everyone complain that this year’s team has no offense. We lose one guy, Jason Bay, and suddenly our offense has evaporated into thin air? Yeah, right. Let’s not forget the fact that we have Youk, and Pedroia, and Ellsbury, and V-Mart for the entire season (as opposed to last year’s half season due to this arrival at the deadline). Add to that a revived Papi and Scutaro and I really don’t think there’s any huge cause for concern. I mean, look at this past season. It’s hard to get past the epic fail that was the 2009 ALDS, but we did finish third in the Major Leagues in runs. The negative view of our offense this year is motivating, I guess, but we should also keep in mind that it’s not entirely founded. I refuse to worry about the entire team’s offensive production simply because we allowed one dude to walk. One guy does not a baseball team make or break. On Monday, Eric Gagne confessed his use of human growth hormone. That sure explains a lot. Johnny Damon is a Tiger, which makes our lives a whole lot easier. Believe that.